If you have a puncture or leak, you need something to plug the hole. The traditional U.S. raft repair clamp, developed for the military, incorporates two ellipse shaped convex metal pieces with rubber on the edges and a post and wing nut connecting the two in the center. They come in three sizes, 3 inch, 5 inch and 8 inch (length of the ellipse). You rarely see the 8 inch clamps anymore, except on a few marine rafts. My preference is to have two 3 inch clamps and one 5 inch clamp. Failing that, I'd prefer seeing as 3 inch and 5 inch, rather than just one or two 3 inch clamps. TIP: Click here for instruction on how to use these raft repair clamps. Hoover and EAM include a single 3" raft repair clamp. Survival Products and Air Cruisers include two 3" clamps. BFGoodrich includes one each, 3" and 5" clamps, on the larger rafts, and a single 3" clamp on the 4-person. Winslow includes a 3" clamp in all rafts. In Part 91 and 135 equipped rafts, Winslow adds a second 3" clamp and a 5" clamp. We think a single clamp is barely adequate. Both RFD rafts include a graduated set of three tapered raft plugs for smaller holes (1.25 inches diameter and less). These are black rubber cones with ridges which are shoved into the hole until they are tight, sealing the opening. I have tried the conical repair plugs and they work reasonably well for smaller holes, however I view them as a supplement to clamps, not a replacement for clamps. I don't think they are nearly as secure as the clamps, based on my experience, and should not be relied upon as the only repair equipment on the raft. Only Winslow and Air Cruisers included PRV (Pressure Relief Valve) plugs. While failure of the PRV isn't common, it does occur and the only solution is to have a plug or some other means of stopping the leak on board. Air Cruisers, as previously noted, recommends plugging the PRVs immediately after the initial inflation. Their PRV plugs look nothing like a plug, but the instructions in the manual are clear. They are equipped with a float in case you drop them into the water. We'd prefer the higher security of a tether. In any case, we're not sure that we agree that this is of such high priority that it should be the number four item on the immediate action instructions. In our opinion, survivors have much higher priorities with which to be concerned at that point in time. If they are that concerned that a PRV may not seal reliably, then they ought to change to a higher quality more reliable product. Winslow includes a pair of small plastic Mirada PRV plugs. Since our last review they have responded to our suggestion and equipped them with a wrist tether for improved security. Winslow also includes a 10 yd. roll of duct tape, which they list as part of the raft repair kit. They claim they have found the duct tape to work well sealing holes and rips. They claim it will last for up to a week and we were surprised to see in our very limited test that it did seem to hold and retain pressure in the water. Never-the-less, the tape also has myriad other uses in the raft and is a great addition to the kit, irrespective of its leak sealing capabilities. Even if it wasn't useful for small leaks, it would be an excellent choice for a raft SEP. These were generally a real disappointment. It never ceases to amaze me. Raft manufacturers generally still neglect one of the most important and vital survival tools, the knife. This is especially aggravating on high end Part 135 rafts where a few dollars spent on better quality would seem less of a problem. High quality, brand name American made locking folding knives can be had for under $20 wholesale. Honest to God, original locking Swiss Army Knives from Wenger and Victorinox can be had for $20 to $40 wholesale. There has been some progress, it's not hopeless. When last we looked, not a single knife was even close to adequate except for a fixed blade knife from Winslow no longer offered. Now, Hoover and Air Cruisers offer decent quality, all stainless steel utility knives. Winslow has a moderate quality, all stainless steel folding knife with a locking blade, a very important safety feature in our opinion, and the only one in this review. Let's also not forget the multi-impliment tools which incorporate at least one knife blade and pliers, such as the Leathermans, Gerber Multi-Plier, SOG Paratool and Buck Tool, as well as others. Any of these multi-tools would be an asset to a survivor. Winslow offers the Leatherman Wave multi-tool as a option ($108). Hoover includes a standard "US" mil-spec pocket knife with can opener, bottle opener, screwdriver, awl, and a 2.5 inch spear point knife blade, standard U.S. military issue. It is at least a decent quality knife, if not a locking blade. EAM includes an inexpensive cheaply made pocket knife with a single drop point blade, can and bottle cap openers and lanyard. The EAM unit got wet upon deployment and the bolsters started rusting immediately. The only knife in the RFD Navigator is the small blunt tipped raft knife, completely inadequate. The RFD "R" series will be equipped with a Revere USCG approved jackknife, with a 3 inch sheepsfoot blade and a can opener. The blade does not lock, but is equipped with a very heavy spring, not very easy or safe to open with just one hand. The blade isn't the most versatile or functional shape, but conforms to the no sharp point philosophy held by many for knives in life rafts. A loose tether is attached. While the blade and liners weathered our short water test, other parts began rusting within a couple hours of immersion in fresh water. Survival Products includes a very poor quality knock-off of a multi-tool Swiss Army Knife. BFGoodrich includes a poor quality traditional stockman's pocket knife with one 3 inch spear point blade, an awl and pair of combination bottle/cap opener and large/small screwdrivers. This started to rust soon after immersion. Air Cruisers includes a decent quality Camillus stainless pocket knife with a 2 5/16 clip point blade and bottle opener/screwdriver with a lanyard attached. Winslow includes a moderate quality all stainless steel lock back knife with a 3 inch drop point blade with a tether attached. None of the blades were particularly sharp. No sharpening stone was included, a deficiency in our opinion, though not nearly the problem it would be for a marine raft. The non-locking blades pose an unnecessary safety hazard in our opinion, particularly unwelcome in a survival situation with very limited medical options. I continue to believe that it is important for survivors to have immediate access to the flashlight upon boarding the raft. This is an item of equipment which will be invaluable to survivors in a nighttime incident, yet isn't readily available in most of the rafts. It should be secured in plain sight or in such a manner that it cannot possibly be missed at night and so that it cannot be swept overboard. Winslow got the message and all its canopied rafts are now equipped with their "Quick Grab" flashlight. This is a high quality Pelican Products Magnum (2 x AA) light which is in a vertical sheath on the right canopy arch tube leg in plain view with a bright orange placard that says "FLASHLIGHT." It is tethered to the raft and immediately available for use. A spare bulb and batteries are in the SEP. In our test rafts these lights were equipped with lithium batteries. Lithium batteries are far superior to alkalines, giving longer life and much improved performance in colder weather. They also weigh less, for what that's worth. Unfortunately, Pelican have apparently been having some problems with their bulbs and the lithium batteries, which actually deliver more than the nominal 1.5 volts that a AA battery is supposed to provide. As a result, Winslow has switched back to alkaline batteries until the problem can be solved. Hopefully Pelican will solve the problem, otherwise Winslow would be wise to find another supplier, despite Pelican's quality. Survival Products and EAM all include standard semi-waterproof 2-D cell flashlights with conventional bulbs. Only EAM includes a tether. Hoover uses a 2 x AA Maglite knockoff. No flashlight is included with the RFD Navigator and Winslow basic rafts (FA-DR and Basic GA-ST). Air Cruisers and BFGoodrich use a pair of waterproof 2-AA Lithium battery powered Rayovac "Roughneck" flashlights with krypton bulb and zoom lens. A tether is attached to the lanyard ring. We especially like the concept of two complete lights, which eliminates the need to change batteries and bulbs. The Air Cruisers flashlights were wrapped together and proved impossible to separate without cutting them apart. This flashlight has a push-on/push-off style switch on the top of the body. 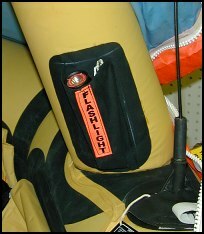 I have seen this style flashlight in transport category aircraft SEPs (by DME) and have seen the switch turned on when it was packed, despite a slip-on plastic guard added to prevent that, which failed. All the lights in our review worked fine, but that is a potential problem.